Crime fiction readers, listen up: if you love gritty, cinematic, edge-of-your-seat thrillers, I've found one of your future contenders for favorite book of 2018. 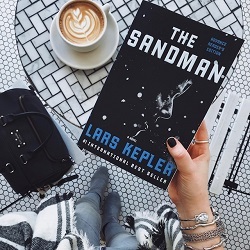 Today’s featured Buzzworthy 2018 Book, THE SANDMAN by Lars Kepler (March 2018), is one of those rare books that balances meticulous plotting, edge-of-your-seat suspense, and an almost mythic serial killer to pitch-perfect effect. Cinematic, action-packed, and bone-chilling, THE SANDMAN is poised to deliver a standout 2018 thriller read. It might release in March, but I’m betting it will top the “Best Of” lists for fans of Scandinavian greats like THE GIRL WITH THE DRAGON TATTOO by Stieg Larsson and THE SNOWMAN by Jo Nesbo. Read this book as part of the Joona Linna series or as a standalone (I did the latter! ); either way, you’re guaranteed an utterly gripping ride. It’s been a while since I could so confidently recommend a crime book, but I’m recommending THE SANDMAN without hesitation or qualification. 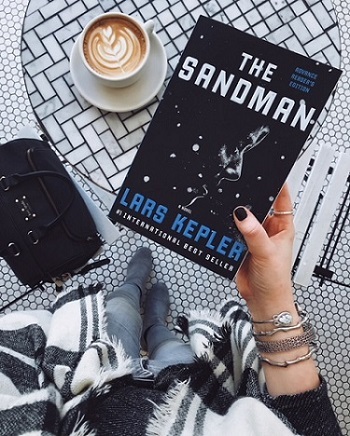 Nordic Noir fans and genre newcomers alike will find THE SANDMAN as chilling as the Swedish winter, and as utterly addictive as your favorite TV crime drama. If you’re unfamiliar with my “Buzzworthy Books” series: these posts serve to preview reads I’m already recommending for the coming year. Each post highlights three key elements that make the featured book exceptional enough to start learning about them well in advance! Cinematic, action-packed pacing. 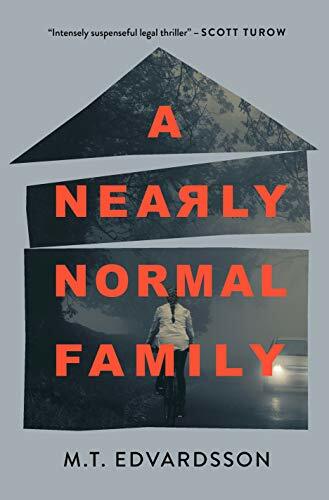 I’m always an advocate for great slow-burning mysteries, and I tend to love the more procedural-oriented pacing of Nordic Noir. At the same time, I’m also the first to admit: sometimes you need a book that just keeps you in breathless, edge-of-your-seat suspense. If you’re looking for the latter, look no further: THE SANDMAN is a 2018 Nordic Noir must-read for you. From the first page of this hefty crime novel to the very last, I was completely, utterly absorbed—and that's saying something, because this book clocks it an 464 pages! I actually read this book in two days, that's how unputdownable I found it. Kepler (a writing duo) has crafted a Nordic Noir novel with the kind of accessible, engaging pacing that made THE GIRL WITH THE DRAGON TATTOO such an international phenomenon—Scandi crime is known for being a bit more dense than other crime fiction subgenres, but Kepler throws this element of genre tradition to the wind in the best way here. If you’ve sampled Scandinavian crime fiction but struggled with its typically slower, more procedural-oriented pacing, give THE SANDMAN a try. A villain that can keep up with the best of them. As crime fiction readers, I think we can all agree: there’s something extra compelling about serial killer thrillers. Whether you’re a Silence of the Lambs fan or are hooked on M.J. Arlidge’s DI Helen Grace series, I would argue that crime fiction readers come back to serial killer thrillers more than almost any other archetype in the genre. THE SANDMAN pairs the grim atmosphere of Nordic Noir with a serial killer whose backstory and mental state is complex and completely intriguing. Interestingly, the serial killer at the heart of this story takes on an almost mythic quality, with police officers and prison wardens holding a deep-seated fear of the ability of this one man to get inside their heads and alter the course of their lives just by his cruel manipulations. I loved the dose of drama that Kepler gives their villain: the serial killer central to THE SANDMAN is, dare I say it, a bit of a crime fiction icon in the making. He’s ruthless, cunning, and shrouded in just enough mystery to keep me wanting more and more information on his psychology, his background, and his motivations. And “good guys” who can keep up with the best of them, too. It’s no surprise that one of my favorite elements of this book was its vivid and compelling characters—Nordic Noir is known for its richly-developed characters, and THE SANDMAN is no exception. The two police officers central to this story make for the best companions a reader could hope for in this dark, shocking journey. Joona Linna and Saga Bauer are refreshingly unencumbered by genre stereotypes; both carry their own burdens, but these burdens feel real and authentic to each character. They’re not overdone or overdrawn caricatures of the “defective detective”; they read like people, and better yet, they read like people who you want to root for. Saga Bauer was a particularly fascinating character to me: a young woman who, in many ways, feels held back by or misunderstood for her physical beauty. She’s tough as nails yet deeply fragile, and I can imagine fans of Lisbeth Salander or Mia Kruger falling head over heels for this character. If I can sneak in one last argument for this book here... A.A. Knopf has absolutely nailed the cover on this book—it’s stunning. The hardcover will also have deckled edges, which are my favorite! Basically, pre-order it now because this packaging is worth the wait.